Sometimes, you end up missing something. Maybe you don't have page numbers, or the year, or you have a journal title, but it's an incomprehensible abbreviation. How do you find the missing information? If you have a journal or book title, start with that. Look up Journals in our Journals by Title/journal finder search and see if they are available in an online database or subscription. If you only have an Abbreviation, try one of the Abbreviation lookups listed below. Even if you aren't sure what the date is, check in the databases. Most databases allow you to search within a specific publication. Even if you can't see the full text of the article, the database entry for the article will have enough information for you to complete the citation. Many journals also have webpages on which you can search the tables of contents, often back several decades. The full text might not be accessible, but the citation information will be. For books, check CONSULS, the library catalog, or WorldCat, a combined library catalog for libraries all over the world. Again, the information in the record should be enough to complete the citation, even if you can't get at the book right then. You can also search Google Scholar or Microsoft Academic Live (see search boxes below), which are wide ranging scholarly search engines. If you have the exact title, put it in quotes; or try the (first) author's last name and keywords from the title. You might find the publisher's page, or maybe a citation in another paper. You can also contact a librarian, either directly to the Reference Desk (see right) or the subject librarian in your field. Search our library and the world’s library collections through WorldCat, the world’s library catalog. Easily place Interlibrary Loan requests to borrow materials from libraries worldwide. 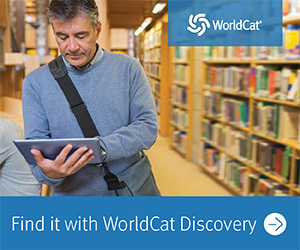 WorldCat Discovery is a customized version of worldcat.org highlighting SCSU's collections and beyond. OCLC catalog of books and other materials in libraries worldwide. Contains all the records cataloged by OCLC member libraries. Specialty sources for journal title abbreviations in many academic fields. Microsoft's version of a library database. You can also limit by subject (some subjects are still being added). Be sure to check the journal finder for library access to journal articles.